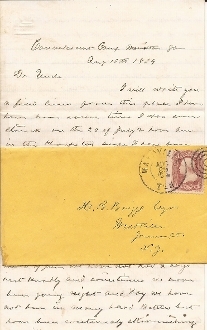 Soldier's letter, 4 pages, Convalescent Camp, Marietta, Georgia, August 19th, 1864. R. B. Kipp (Co. D, 65th Illinois Infantry) writes pertaining to the Atlanta campaign, fighting & casualties. "...On the 6th inst our division had a hard time we were on the extreme right and were trying to turn the rebels flank when we suddenly found ourselves within about 400 yards of the line of Rebels works, they opened with grape and canister and we lay under their fire for about 1/2 hour before we got orders to charge the works..."
For more of the content of this battle-descriptive letter, please see the scan.